Cicada killers (Sphecius speciosus) are solitary wasps that become active during the summer. Adult wasps do not feed on plants but on nectar of flowers. The cicada killer is approximately 11/8 -2 inches long and one of the largest wasp species in North America. It has a rust-colored head, thorax and wings with orange legs and a black and yellow striped abdomen (Figure 1). Their coloration is similar to that of yellowjackets or other wasps or hornets. Male wasps are typically smaller than the females. Cicada killer eggs are translucent, green-white and often described as “cigar shaped”. Larvae can reach a maximum length of 11⁄4 inches but mature, quiescent larvae are somewhat shrunken and have a leathery texture when compared to other soft-bodied larvae. 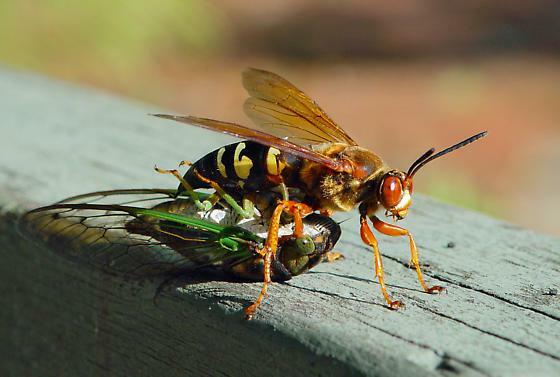 Cicada killer wasps are considered beneficial as they feed on cicadas which are injurious to young trees. However, cicada killers emit loud buzzing noises, particularly around burrows, to intimidate predators and can be frightening to humans. Male wasps will also defend their burrows by dive-bombing anything perceived as a threat but will not sting. Female wasps can sting but only when mishandled. Females will dig large burrows up to four feet deep in the soil, creating holes and mounds of displaced soil on the turf surface (Figure 2). Although cicada killers are solitary wasps, they often remain active in the same area following emergence. Cicada killer wasps emerge in mid-late summer. Males die soon after mating but females will remain active for approximately two months during which time they will dig a burrow in full sun in well-drained, light-textured soil. Soil particles are kicked back with the hind legs which form a U-shaped mound at the entrance. At the end of each burrow, an individual female will create three to four cells in which she will later place her eggs. Once cells have been constructed, females leave to hunt cicadas by sight, often capturing them in flight. Once caught, the female will sting the cicada, paralyzing it and drag it back to the burrow (Figure 3). She will lay one egg on her prey and place both in each cell of the burrow. If the cells in the primary tunnel are full, she will construct secondary tunnels and fill with additional cells and larvae before being sealed off. One burrow may have as many as 20 cells. After two to three days, eggs hatch and the larvae feed on the paralyzed cicada provided. Larvae feed for up to two weeks, until only the cicada’s outer skin remains. During the fall, larvae spin a silken cocoon for overwintering. Emergence holes to burrows can interfere with ball play in turf and mounds of dislodged soil are often unsightly. They are also large and formidable-looking wasps which can evoke fear in some people. Cicada killers are generally considered beneficial insects, since they feed on cicadas, do not feed on plants and rarely sting unless very provoked. Therefore, it is usually not necessary to physically or chemically control cicada killer wasps unless their presence is a nuisance. Some cultural practices can help prevent the establishment of cicada killer nests. Wasps do not like wet soil so drenching an area with water may cause them to abandon the site. 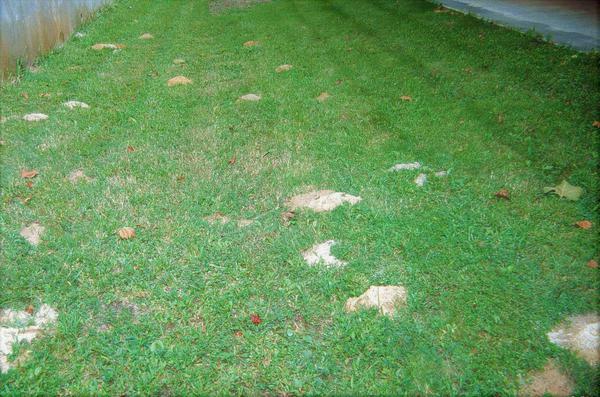 Applications of lime and fertilizer can encourage turf growth and may eliminate a cicada killer infestation as females typically look for bare soil surfaces in which to dig burrows. Applying insecticidal dust (carbaryl) to the entrance of each nest, will result in some control of cicada killer wasps, provided the burrow opening is not closed. Disturbing the burrow will cause the wasp to abandon the burrow and start excavating a new tunnel, eliminating the possibility of it coming into contact with the insecticide. Common name: cicada killer, giant ground hornet, scientific name: Sphecius speciosus (Drury) (Insecta: Hymenoptera: Sphecidae). Stange, L. A. 2012 (revised). Featured Creatures. Entomology & Nematology, FDACS/DPI, EDIS. 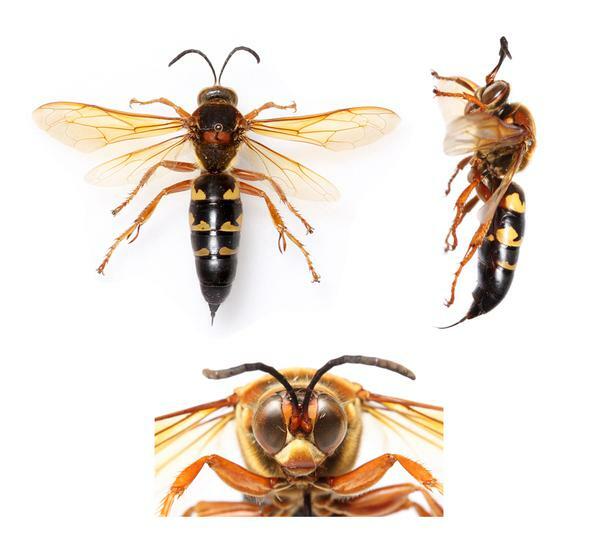 Improved key to new world species of Sphecius (Hymenoptera: Crabronidae). Holliday, C. W., and J. R. Coelho. Annals of the Entomological Society of America 99: 793 - 798. Life history and habits of the cicada killer in Ohio. Dambach, C.A., and E. E. Good. 1943. The Ohio Journal of Science, 43: 32 - 41. Life history, habits, and control of the cicada killer wasp in West Virginia. Weaver, J. E. 1995. West Virginia University Agricultural and Forestry Experiment Station, Circular 161. Size-specific provisioning by cicada killers, Sphecius speciosus,(Hymenoptera: Crabronidae) in North Florida. Hastings, J. M., et al. 2010. Florida Entomologist 93: 412 - 421. The Sand Wasps: Natural History and Behavior. Evans, H. E., and K. M. O'Neill. 2009. Harvard University Press. pp 37 - 43.